Nothing says "summer fun" like a bleak journey through a ruined society whose inhabitants are more deadly than the monsters that caused their original downfall! This week, Jorge and I talk about The Last of Us. There's a lot to talk about: stealth mechanics, family dynamics, and doomsday preppers all make appearances. As always, we'll give a spoiler warning when we dive into specific plot points. For those of you who have faced the fungal apocalypse and lived to tell the tale, feel free to jump into the comments with your thoughts! Firstly, I am so pleased you did this debrief! Ian and I have been checking your website ever since we finished Last of Us waiting to hear your take. So, many thanks for sharing. For the game overall, we did enjoy it. Obviously, the story was great, aspects were really enjoyable, but we too encountered some frustrations. I think we enjoyed the gameplay a bit more than you guys seemed to, but we actually had some mechanical issues, which I haven’t heard much discussion of in the various reviews of the game. For our playthrough, loading could be super long and clunky, the sound cut out on one or two occasions, there was a fair amount of texture popping (particularly later in the game) and even one incident where a ladder didn’t load. It was bizarre and meant we were wandering aimlessly around the room jumping all over the place, throwing bricks and bottles trying to figure out where to go and the ladder just never appeared, not until we tried the game again later. It was very bizarre. Not sure if anyone else encountered such issues. You also made a comment about Ellie and the Fireflies likely not asking her permission before surgery, which I was hoping to respond to. My understanding (and I could be wrong, so please feel free to comment) was that she was never conscious in the presence of the Fireflies. I think they resuscitated her from drowning (which was an awesome sequence, by the way), but I don’t think she was ever fully awake in their presence, based on the conversation she and Joel have in the car. I believe she asks if the Fireflies were there and what happened. Anyway, it’s fairly small, but certainly adds an interesting element to the story and character motivations. In the vein of the story, I loved that it was surprising and unexpected. There were certainly elements that were somewhat predictable, but neither Ian nor I predicted the ending. Its finale was honest, human, unpredictable and incredibly heartbreaking. And, I think it is awesome that video games are going down this interesting path of dynamic characters and unpredictable story outcomes. It’s great and I hope we continue to see more of this. That being said, I do wish there was a little more choice in this game. As you may remember, we just finished the Walking Dead relatively recently. So, we came into this somewhat similar, father/daughter ‘zombie’ game with the experience and vast choices presented through the WD and, as a result, I wanted a bit more of that here. Obviously, these are two different games and two different types of games, but it was really hard to not want to be able to choose to give Ellie a weapon earlier, or to choose to save Ellie, or to choose to shoot Marlene in cold blood, or to not do these things. I think there would still be players who would have had the scripted outcome, particularly (as so many discussions of this game have said) individuals who are parents, but it would have been nice to have the different possible endings to broaden the discussion. Anyway, still a great story though and overall an enjoyable gaming experience. Thanks, as always, for your thoughtful discussion and I hope you both have a great 4th of July! Hey Katie! Great points. Bummer about those technical issues. I may have experienced the dialogue dropping once or twice, but thankfully that was pretty much the extent of it. Excellent point about Ellie and her choice (or lack thereof). I think you're right; I don't remember her ever being awake in the Fireflies' presence. That being said, I think it was implied that she would have been more willing than Joel to make the sacrifice. Then again, Joel's actions would have foiled this either way, sadly enough. Like you said, and despite my complaints, I am very enthusiastic about this direction. 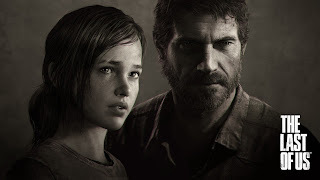 Like the Walking Dead, The Last of Us is one of those games that's brave enough to break from the usual "You're a hero who saves the world" plot that so many other games have. Looking forward to seeing this trend continue. What is the movie content? FYI you totally can avoid that Bloater in the hotel basement! Likewise the sleeping one in the University dorms and the 3 in the SLC tunnel. I think I've been spoiled by Dishonored. Just one note about the complaints with Clickers killing you with one hit: if you're bitten, you're infected. Uh oh, look out everyone, we have a expert gamer over here!